Deck the Halls with boughs of holly, fa la la la la la la la and further more la. I have no gift to bring, parumpa pum pum. Let's hope (but not pray, as that can get you into all kinds of trouble in this blessed country at the moment) that things remain peaceful this festive season. To be frank, it's not been a very good year for the country's religious minorities and a few months ago, I even found myself joining a group of demonstrating Christians up at Monas as they protested their increasing persecution. I should stress that I myself am a non-believer, but that I believe it's important for people to be able to sustain their delusions of heavenly redemption unmolested by the tragically confused, stick wielding members of a rival religion (surely a worse experience than waking up on Christmas morning to find that Santa has clambered onto your roof, dropped his handsome, red felt trousers, sat on the chimney and let loose a volley of miniature Christmas puddings down onto the living room below. Non-Muslim worship is indeed getting trickier here. For believers, plan A is obviously to build your own church (or temple, or synagogue... actually, scratch that last one, that's not going to happen). Current Indonesian law enforces a tyranny of the religious majority though and so that's not working out. So frustrated faith heads turn to plan B, namely inviting a few people over to their homes for a prayer session. Attempts at this have also resulted in a lot of purple faced shouting by various types claiming that the practice is both illegal (saying prayers at home, illegal?) and noisy (this complaint is certainly a case of, "Physician heal thyself."). And so we moved swiftly along to plan C, i.e. trudge into a muddy field, hope it doesn't piss down with rain, and say a few prayers there. Alas though a couple of weeks after the aforementioned Christian demonstration that I attended, the vicar who had led the demo was stabbed in the stomach as he led his flock in muddy worship. So I think it’s fair to say that plan C hasn’t panned out too well either. Proselytizing to decent, Allah fearing earthworms is clearly not to be countenanced. This leaves, most chillingly of all, plan D, which has been offered to the much persecuted Islamic Ahmadiyah sect over in Lombok. The local governor there can't understand why the Ahmadiyah community hasn't embraced with open arms an offer to relocate them all to a nearby island. Apartheid? Jewish ghettos? The Gulag? Concentration camps? Well, you can select your own ghastly historical parallel. I guess though that really committed orthodox militant types could still boat over to the island and have a go at them. Although a more striking image of a suicide bomber wearing a green helmet with a crescent moon and star symbol on it climbing into a cannon and being shot onto the island from the mainland as a human cannonball has just poked its way into my head. I guess that moves us on to plan E, whatever that is. Several disused submarines anchored together on the ocean floor perhaps? This is all getting a bit negative though. Tis the season of goodwill towards all men after all (which is this Christmas to be secured by 87,000 police officers and security personnel. 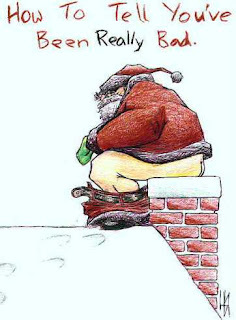 Warning: actual amount of goodwill towards all men may vary according to local factors, and the management and shareholders of Christmas PLC can't be held responsible for any disappointment caused by any of its products). Last week however, I had the pleasure of attending a charity Christmas dinner, complete with a perhaps rather unconvincing Indonesian Santa Claus sporting a comedy beard that seemed to engulf his entire face. It may have been 30°c outside but I had no problem at all in scoffing several colon stretching plates of midwinter grub, and then came the entertainment. A group of kids from a local orphanage who were the beneficiaries of the charity dinner came up on stage to serenade us all with some jolly Christmas Carols. It was a touching moment made all the more impressive by the fact that the kids couldn't speak a word of English and had clearly learned the carols phonetically, much like many of the rock covers bands that play in bars around town (not to mention people reading holy texts all over the country). What with Indonesia, and indeed many other places, currently flushing Enlightenment philosophy down the toilet, I half expected some FPI stormtroopers to barge in and trash the tables of turkey. Getting these presumably Muslim orphans to sing Christmas carols surely can’t be something they’d approve of. It's depressing isn't it folks? And silly. As John Locke once noted, if human beings really are going to be judged by a god when they die, then you have to grant them the use of their own free will, so that they may choose a path through life from which such a judgement about them can then be made. Thus the very nature of religious faith itself is contradicted by compulsion. There you go, apply a bit of logic to the situation and the problem is solved. Anyway, happy midwinter solstice one and all. And pray hard for a peaceful New Year my children. Very hard indeed. Amen. I had the rare foresight to take last Monday off, giving me a solid four day weekend of good vibrations and sun kissed mosquito bites to enjoy. And so, at some ungodly hour on Saturday morning, I headed to the airport by taxi (I elected not to walk it this time) and the inevitable unannounced one-hour delay courtesy of Sriwijaya Airlines. I guess they were really trying to pique our appetites for the in-flight square of flaccid green cake, which looked like a moss covered slice of Battenberg. I was headed around 300 km due north of Jakarta to the island of Belitung, which lies off the east coast of Sumatra, just next to the island of Bangka. Belitung is around the same size as Bali, although with considerably fewer Circle Ks and gentlemen clutching briefcases full of discount watches to enjoy. The island has traditionally been a big mining area. More recently however, Belitung has been trying to attract tourists to its calm, turquoise seas, bule white beaches and idyllic offshore islands. Well, I'd never been in any case and four days of relative peace, off the information matrix, in order to try and reintegrate myself as a human subject seemed like just the ticket. Although having said that, I did found out that flies can operate mobile phone touchscreens on my travels. Those buggers have clearly out evolved me on that score. A mere 40 minutes after takeoff, we touched down in the town of Tanjung Pandan and I got a local driver to ferry me up the coast for an hour to the main beach area. As my man tooled along the road, chain chuffing LA Lights, cranking the Dangdut up to teeth rattling volume and banging on about English Premier League football, I took in the endless Sawit plantations and empty roads and knew that I was in for a supremely and buttock unclenchingly stress free weekend. 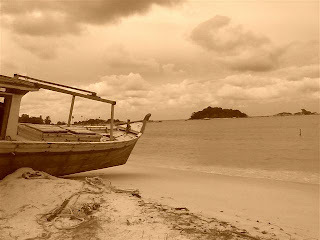 Belitung has become well-known in Indonesia recently as the setting for the movie, 'Laskar Pelangi' ('Rainbow Troops' or 'Rainbow Warriors') which has certainly fared somewhat better than the Greenpeace ship of the same name. 'Laskar Pelangi' is, in fact, now the highest grossing flick in Indonesian box office history and is a well made, feel good tale of a group of impoverished schoolchildren and their teachers, as they struggle with poverty and their hopes for a better future. Arguably the prognosis for this better future is not very good if rapscallions like me have started frequenting the place, but there you go. 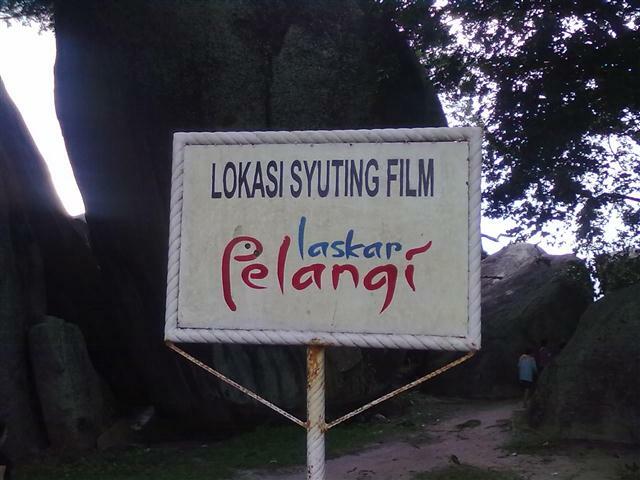 The movie has apparently helped to fuel a mini tourism boom on Belitung. And in fact, a musical of the film will be playing at the brand-new and rather swanky Teater Jakarta up at the TIM arts centre from the 17th of this month onwards, culture vultures. I rented a scooter and headed up the coast. 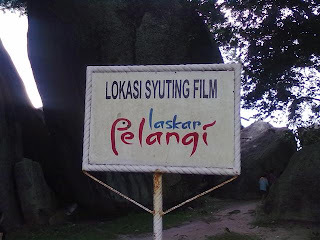 Belitung is surrounded by huge, monolithic boulders, which give it a moody and rugged feel and I soon found myself strolling through a maze of enormous rocks that lay behind a sign saying, "Lokasi Syuting Laskar Pelangi" (I just love that Indonesian English bastardisation, 'syuting'). 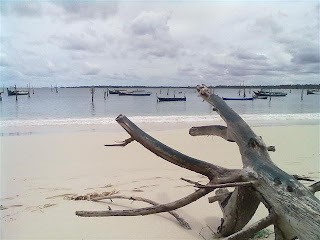 Maybe more tourists will come, but as of now, the unspoiled beaches are immaculate, in contrast to more recent trips that I've made to Jakarta's nearest desert island getaway, the Pulau Seribu (Thousand Islands). When I first hit the Thousand Islands [coughs] years ago, they were only lightly covered in crap, and in just a few places. Now however, ominous swathes of plastic refuse have made wading along some of the nearer shorelines to the capital like that scene in 'Star Wars' where they all fall into the trash room with moving walls and grasping alien tentacles. Belitung remains a veritable Garden of Eden however (albeit one populated by Muslims) and the perfect destination if you're looking for a few quiet days away from it all. I should qualify all of this though by saying that if you're a pale face, then you should be aware that the, "Hello Mister! Where you come from?" factor here is off the scale. Usually when I'm on tour, I have to confess that after the first few, Hello Mister! Where you come froms of the day, I am wont to go on a trans-global run around and start claiming I'm from Iceland or the Ugandan Minister of Trade, just for a bit of variety. In Belitung however, I managed to escape the surly bonds of the Earth's gravity altogether and, when one gobsmacked fishing family clocked my lanky, sweating, big nosed frame hiking along the coast through the tangle of mangrove roots, I claimed that I was from a neighbouring Galaxy. "I'm from the planet Vlkarx in the Postlethwaite Nine system." "I have no need for your puny earth cigarettes, as we Vlkarxians each have a nicotine membrane across our oesophagi." 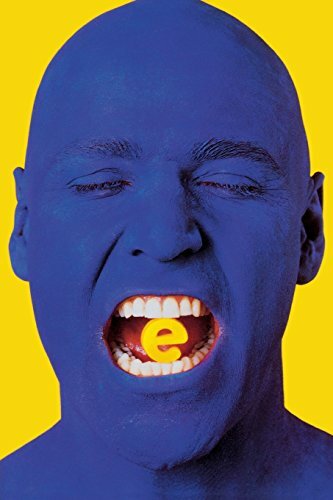 Etc etc. 0h, I get so bored, I get so bloody bored. A day-long boat trip to the surrounding small islands proved to be a winner though and included a slog to the top of a Dutch lighthouse that dates back to 1882. After this, I had a little sunbathe alone on my own stretch of private beach, like a lily-livered Robinson Crusoe waiting for a group of female Lilliputians to emerge from the undergrowth and soothe my furrowed brow with tropical oils. Alas though, this solo holiday proved to be short of loving (and praying, although the eating was quite decent). 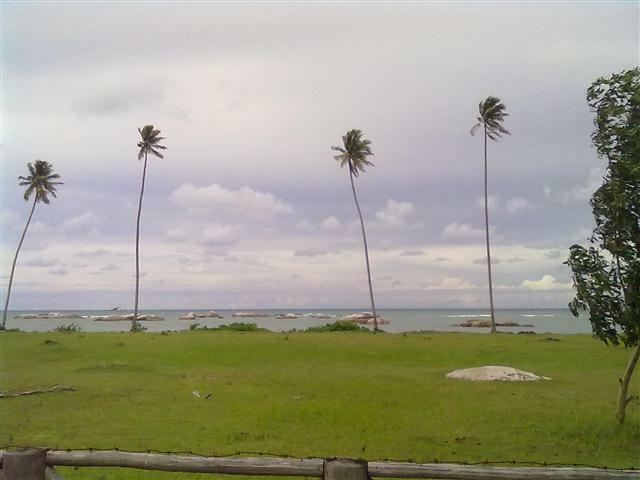 I'd thoroughly recommend Belitung for your next long weekend if you're really looking to get away from it all. Check in at the Bukit Berahu, Kelayang Cottages, or the more expensive Lor In and kick back. 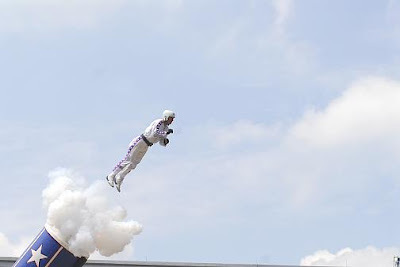 Beep beep... incoming text message... throws mobile in the sea. This week, I thought that I'd take a spin up to where hungry hedonists of all social classes gorge themselves on pills every weekend like mosquitoes around a sockless ankle. I donned my best 'Saturday Night Fever' shirt, the one with collars large enough to allow me to hang-glide off the top of the BNI building, and headed up to Kota and that well-known temple of bacchanalian debauchery known as Stadium. This was all purely in the name of research you understand. Stadium has been in operation for well over a decade now and basically seems to act as a kind of social pressure release valve that allows the city's youth to let off some steam and generally show a little sympathy for the Devil, something we all need to do occasionally in order to temporarily slip the bounds of our socially programmed sedation. Heading inside my eyes tried to adjust to the near pitch black interior and failed miserably. The darkness of Indonesian discos is legendary and still a source of mystery to me. The only reason I can think of for the near total blackout is to protect the anonymity of various high rolling patrons who may be lurking in the gloom with their paramours. Surely one of the primary functions of the modern discotheque is to aid people in their quest for sexual gratification however, and in this context it might be nice to see what you're actually getting (and even if they are of the right gender at all). I stumbled through the darkness, a process not helped by most of the patrons being as high as dirigibles and tottering somewhat unsteadily on their pins, and headed for the bar. There was a little light here, which was a good thing to as the drinks list was not printed in Braille. As I supped on my Long Island, a furtive young man came up to me and offered me a tablet for Rp.200,000. Now Indonesian drug laws are very strict and if the cops can bang you up in the slammer for a few months and shake you down for every penny you've got, then they most certainly will. The war on drugs has taken a serious ceasefire in Stadium however and so presumably the forces of law and order shakedown the club's management instead of its patrons in order that the carnival continues unabated. Dance music and drugs have long had a symbiotic relationship of course, ever since the coked up days of 70s disco. Ecstasy really changed the game back in the late 80s however, spurring several musical revolutions, tabloid hysteria and spawning what Irvine Welsh dubbed, "The chemical generation." The dance-drug interface hardly represents new sociological paradigm however, and the Stadium heads swayed on their feet on the dance floor, nodding to the rhythms like participants in some ancient shamanic rite. Dance music and E perhaps offer a ritual of social integration of a type largely lacking in modern life. Many Jakarta kids certainly seem to need to loosen the surly strings that tether them to the daily drudgery of this often cruel city and float free for a few hours in chemical communion. I swear to you however that I stuck valiantly to alcohol and am willing to undergo a polygraph test if you remain sceptical. 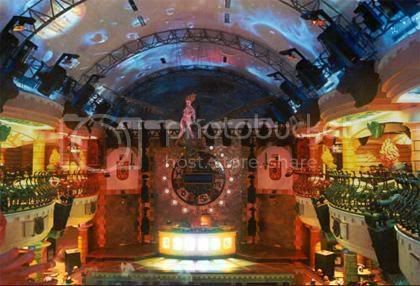 Memories of the evening remain hazy, however things that stick out include a chat with a German tourist in shorts, whom I spilt beer on, running into an old flame on the dance floor and wishing that I hadn't, and being asked several times by the Madame around the club's entrance whether I'd be interested in renting the services of one of her young ladies. She didn't say what for, but I'm thinking it wasn't connected with the valet parking service. I guess I have a quite libertarian view of drug taking. John Stuart Mill in his famous, 'On Liberty' developed a concept of the harmful, i.e. what is not harmful to others is no business of a paternalistic state and it is ultimately an individual's free choice what he or she chooses to consume and ingest into his or her system. Eventually though I decided to call it a night and headed outside into the cold light of day. Beggars crowded the approach to Stadium clutching babies and looking for a handout. Quite unsettling when you're feeling a bit tender. Looking at these poor folk I remembered that freedom from unjustified restrictions, a negative freedom, is only one half of the full Utopian picture. Hand in hand with this should go a more positive conception of freedom.